September 11, 2015 – End your week with a taste of the past. It’s History in Five Friday! Here’s Pulitzer Prize-winning journalist Michael Hiltzik, author of Big Science: Ernest Lawrence and the Invention that Launched the Military-Industrial Complex . You can enjoy our full interview on or after Monday, September 14, 2015. You can follow him on Twitter @HiltzikM or visit his website, MichaelHiltzik.com. 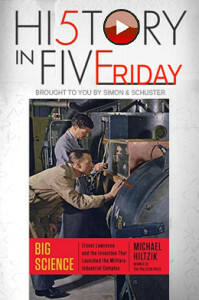 And enjoy more of Simon & Schuster’s History in Five shorts at Facebook.com/HistoryInFive.